On an early morning walk in late August, you are bound to hear the click-clacking of the oak trees. High in their branches gray squirrels are picking and dropping acorns that fall through the leaves and twigs like so many giant raindrops. 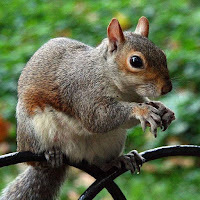 Squirrels learned long ago that, rather than pick and carry each acorn or hickory nut to the ground to bury, it’s a lot easier to drop a bunch at a time, then climb down to collect and cache them. But they have to be quick about it sometimes. One day a few years ago, we came across one of the drawbacks of the squirrels’ efficient operation. Under a bountiful oak raining with acorns from a half dozen squirrels stood a herd of a five deer, eating these gifts from above as quickly as they landed. Even in nature, no system is perfect – unless you’re a deer that likes good service.